Okay this took me a while but at least I got it done. I got this idea from doing a birthday card for my friend,I found a screencap of Vash, then duplicated it and edit it to make it look there is a shadow behind it. 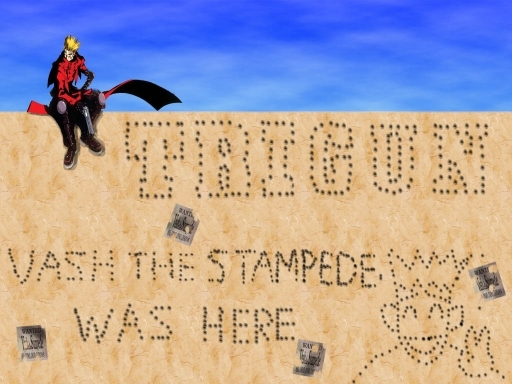 The bullets holes are from a downloadabe photoshop brushes I found online, I had a transparent layer of the Trigun logo and use the bullet Brush (on another layer) to trace the outline of the Logo. The pic on the sides, is from episode 1 if you don't reconize it.